The Clic O23Z earrings by Clic have the shape of small square blocks. Powerful and strikingly simple, with an intense black colour. Minimalistic and subtle, bold and feminine at the same time. Also available in black, blue, purple and red. 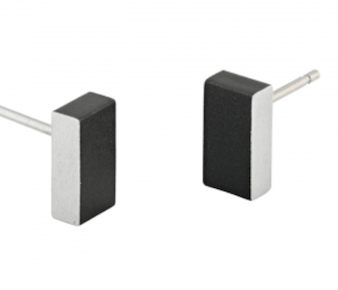 Radiate simple elegance with these beautiful square earrings! A treat for yourself, a perfect gift for a friend. The Clic O23Z earrings are bold and feminine at the same time thanks to the subtle cube shape. The small studs reflect today’s minimalistic trend in fashion. The simple elegance of these earrings is striking. Earrings improve your appearance by emphasizing your face. At the same time, they complete your jewellery collection. 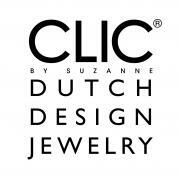 The Clic earrings emphasize and support the visual language of a Clic necklace or bracelet. To guarantee high comfort, the aluminium Clic O23Z earrings are made of lightweight and anti-allergenic aluminium with stainless steel or silver for the stud. You won’t easily lose them thanks to the butterfly fasteners. Designer Suzanne Schaars uses modern materials when designing her jewellery. She only uses aluminium, stainless steel, and magnets. Furthermore, Suzanne works on the basis of two principles; her jewellery has high comfort and invisible fastening. Schaars’ personal motto is ‘enjoy life and create beautiful designs!’. From this motto, she draws her motivation for the design of new creative bracelets, earrings, necklaces, and for improving her existing designs. The inspirations for her Clic by Suzanne come from all sorts of (surprising) places. Actually, she hits upon the best ideas at moments when she is not working. As is the case with the Clic O23Z earrings. Clic earrings are available in different geometric shapes. In addition to these ear studs, we also offer creoles, round, or oval-shaped earrings. Why not buy these aluminium earrings in combination with one of the bracelets or necklaces by Clic jewellery to complete your geometric jewellery collection!